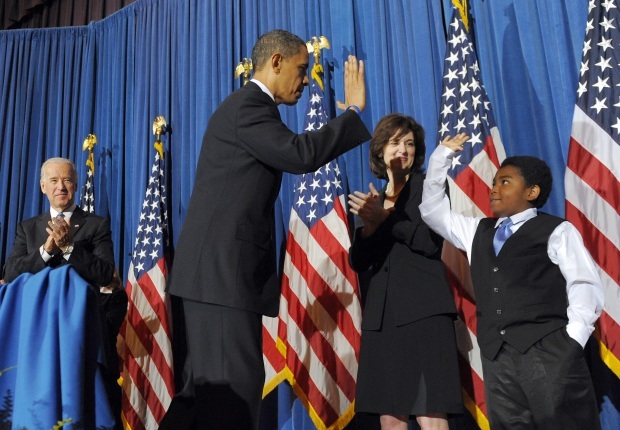 Obama Told He's "a Hottie With a Smokin' Little Body"
That would never happen in D.C.
Applauding for the president? Well, sure. Telling him, "You're a hottie with a smokin' little body"? 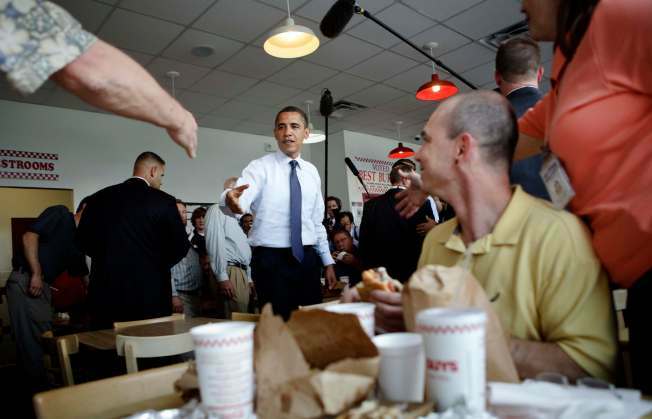 Well, diners at Five Guys or Ben's Chili Bowl never gave Barack Obamathat kind of greeting. You know, the kind that could be construed as sexual harassment in certain situations. Woman Calls Obama a "Hottie"
But today, Luann Haley, 45, openly praised Obama's perceived hot-itude at Duff's Famous Wings in Cheektowaga, N.Y., just east of Buffalo. Hot wings must make everyone feel extra flirty, because Obama was down with it. He replied by giving Haley a big hug -- defined by her later as "a squeeze." The president told her First Lady Michelle Obama would be watching on television. "That's all right," Haley said as the cameras rolled. "Hi Michelle, eat your heart out." Michelle probably had to eat her heart out because she wasn't there to get wings. Sad! The president had surprised about a hundred employees and patrons when he popped into the spot for wings. He was told about a lunch special, but insisted on ordering wings. "This is the wing capital," he said. Yep, you know everyone always says that about Cheektowaga. Love those Cheektowaga wings! Obama ordered the medium, but was told halfway through the meet-and-greet that he needed to get them extra spicy, so he switched his order to five regular, five extra-spicy. A painted sign on the Duff's wall explains: "Medium is HOT. Medium hot IS VERY HOT. Hot IS VERY VERY HOT." Receptionist Mary DiGiacomo told him they were on the house. "No, I've got to pay," he told her. He paid at Ben's Chili Bowl, too. At least some things are the same no matter where you go. Meanwhile, women of the District: Get your presidental compliments ready. Don't let another chance to get hugged by the leader of the free world pass you by.